Photograph an actor in order to help cinema. Fashion spectacle takes a completely new form when interpreted by an actor. 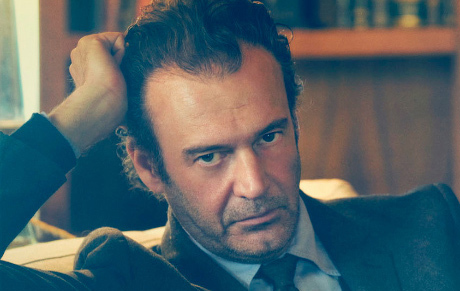 Incidently, for once, the actor is not american: he’s Giorgio Pasotti, italian. The movie business in our Country suffers: during the 50s and 60s about 200 movies were produced, shot and distributed, today the number is around 50. Fifty movies that won’t be watched abroad, while French and British movie businesses promote themselves and spread movies out of the Country boundaries. It’s our fault: how can we expect that italian talents would become worldwide stars? For example, would Vincent Cassel have gained such a success if he hasn’t been seen in cinemas all over the world? Fashion can do a lot, in this sense: unfortunately italian maisons – except Dolce&Gabbana – are the first not to trust in italian actors. Italian designers do nothing but inviting our celebrities to fashion shows. I’d like to see an adv campaign with italian celebs. Is it too much to ask? Giorgio Pasotti wearing Hermès, ph. by Rankin.